Katherine Harmon Courage is the author of the new book Octopus! : The Most Mysterious Creature in the Sea. 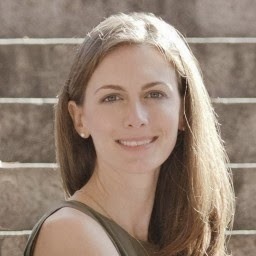 She is a contributing editor for Scientific American, and she lives in Colorado. 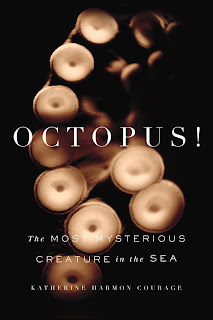 Q: What is it about the octopus that is so fascinating to many people, and why did you decide to write this book? The octopus is one of the strangest, most alluring animals. If you saw one walking around on land in a Sci-Fi movie, you would think "yeah, right." But here it is, right here on Earth. They just hide well underneath the waves, so we have been slow to recognize them as such incredible animals. They have been a part of culture--culinary, art, mythology--for thousands of years. But recently they have also been teaching us some incredible things about science. For instance, they can camouflage using color, light, and texture; but, from what we know, they are color blind. And other than color vision, our eyes and their eyes have evolved to be almost identical, despite our last common ancestor being a sightless sea worm that lived at least 500 million years ago. What finally drew me in and convinced me that I had to write a book about the octopus was a recent study that showed that octopuses can actually use tools. These squishy invertebrates were collecting coconut shell halves in the wild and using them to make shelters when they felt threatened. Needless to say, they have a lot to teach us about the emergence of intelligence--in addition to other fields of science. Q: What was the most surprising thing you learned in the course of researching your book? Aside from their incredible (and mysterious) camouflaging abilities and their stunning intelligence, I was very much struck by their suckers. Each octopus usually has more than a thousand individual suckers, and each one can be controlled individually. Perched on top of a movable stalk, a sucker can rotate, open, pinch, and, of course, form a powerful seal. They can also "taste" the water around them via chemosensors (imagine if you could taste that apple slice you were holding!). Individual suckers can also coordinate with one another. Biologists I spoke with observed octopuses passing small objects up and down their arms using only their suckers. They nicknamed this move the "conveyer belt." Q: You write about the intelligence of octopuses, as well as their tendency not to be social, and you state, "The octopus's dearth of these prosocial behaviors puts it at a considerable disadvantage for gaining easy esteem from humans." How have those two characteristics--intelligence and solitude--affected the octopus and scientists' ability to study them? A: The octopus is obviously very different from the many other "intelligent" animals we study--dolphins, dogs, chimpanzees, whales, elephants. Not only are those animals all mammals and vertebrates, they are also all extremely social. In fact, so much of what we think we know about their intelligence comes from observing their social interactions: whales talking to one another, dogs figuring out the group pecking order via play, chimps teaching other chimps how to use tools. But once all of this so easily recognizable (to us, at least) complex behavior is off the table, as it is with the solitary (and often cannibalistic) octopus, we are left looking more carefully for other behavioral clues about intelligence. Although this is of course more difficult, it is also good for science. It forces us to get out of our own social, mammal, vertebrate heads and try to put ourselves more in the mind of the octopus. A fantastic and refreshing challenge! Q: Did you have a favorite among the locations you visited to research the octopus? A: I loved my time in the small Greek fishing village of Gythio. The restaurants there along the harbor string the day's catch of octopus above their front doors. Hardly anyone in the town spoke English, and my Greek was even skimpier. But when I was able to strike up a basic conversation, everyone was perplexed about why I would write a book about the octopus. It had been such a common, simple staple, so integrated into daily life for so many generations that an entire book dedicated to the octopus seemed almost as mysterious as I found the animal itself to be. This deep connection with the octopus was enchanting to me. A: I am still a contributing editor for Scientific American magazine (where I keep the blog Octopus Chronicles) and have been writing for WIRED, Popular Science, Gourmet and others, which keeps me plenty busy. But I have been enthralled by research going on right now into the human microbiota (the microbes that live in and on us that are turning out to be so important for our health). I am also harboring a secret fascination with fungus. I hope to be able to explore both more soon. A: Well, octopus was actually an odd topic for me to tackle. I grew up in landlocked Oklahoma and detested seafood for the first half of my life. I certainly didn't meet an octopus until I was an adult. But in a way, I think this perspective was an asset when researching and writing the book. I was truly discovering the octopus as I went. Although, I had only nine months to research and write the book--on top of a full-time job--so I guess you could say I had to dive into the deep end. But I was lucky to have such a compelling swimming companion. I still just cannot learn enough about the endlessly amazing octopus.